Natural foods grocery store in existence since 1970. 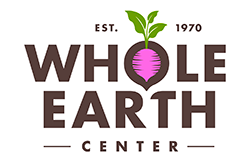 The Whole Earth Center is a community-based natural foods store. Founded by a group of local environmental activists, the store was started with two goals: to provide a place where Princeton-area residents can buy environmentally friendly foods and household products and to generate money to fund environmental projects and organizations. Thanks to the support of our community, that is exactly what Whole Earth has been doing since 1970. The Whole Earth Center provides environmentally preferable produces and services in a variety of ways. (1) We buy the following products locally: Produce - 100% certified organic produce, much of it from local organic farms and Meat - local grass-fed beef, local pasture-raised pork, and certified organic chicken. (2) We sell Eco-friendly Home Products - environmentally friendly non-toxic cleaners, unbleached paper goods, all-natural charcoal, beeswax and soy candles, and more. (3) We sell additional products such as coffee and ice cream from local businesses. (4) We sell Non-GMO Project verified grocery items. We give customers 10 cents back on reusable bags and jars they bring back to the store for their use. Recycle the following materials: 1. #1 and #2 plastic bottles, all glass, cardboard and metals 2. Film plastic generated in store and by community members. The store also serves as drop off site where community members can drop off their plastic film. Plastic film is upcycled by TREX to make plastic decking, fencing and other outdoor items. In 2018 will replace 8 motors in our walk-in refrigerator. The annual energy savings from replacing the walk-in motors is 8,844 kWh and the annual energy savings from replacing the case motors is 5,257 kWh. The Total Savings = 14,101 kWh per year. At a conservative cost of 0.13 per kWh, the annual savings from replacing all of these the EC motors is approx $1,833 per year. The cost to do this project is $2,002.39. This results in a 1.09 year payback on this project. In 2008 installed a PV system that consists of 45 – 205 watt solar panels. The total system size is 9.225 kw dc and was installed by Advanced Solar Products. Shower available for employees who ride their bike to work. Eligible employees who use mass transit are reimbursed for their fare to get to and from work. Encourage customers to shop by bike. Customers receive a financial incentive consisting of $1 off for every $15 spent at register or a punch card that they can use to receive parts at a local bike shop. Received LEED certified Silver designation from the US Green Building Council in 2008 for expansion into 2400 square feet of additional space. Diverted over 93 percent of the project's waste from landfills through recycling and reuse. Health benefits, life insurance, an employee retirement plan, staff discounts, mass transit travel reimbursement and a Princeton Public Library are among the benefits available to eligible employees. As a locally owned independent retailer, we work closely with other businesses in our town to support organic farming, school gardens, bicycling, recycling, energy conservation, and other community friendly activities. Over the years Whole Earth has funded a wide range of innovative environmental education projects. We also provide a place where community members can learn about environmental issues and where they can take action to voice their support and concerns. Celebrate Random Acts of Community every May which is also National Bike Month. Reward random bicyclists biking in town at various locations with a gift packet to various business in town.